I went to Wal Mart this weekend (yes, the evil Wal Mart that my friend calls the "Land of the Missing Teeth") - it can be a scary place late at night.. but I was there during the day... and it's back to school time! I am also signing up to take a beginner spinning class at the Weavers' Cottage on Saturday the 11th in the morning. I have a hankering for a spinning wheel - but first must try them out to see if I even like it! Lastly, the Fiber Fest 2007 is coming up August 17-19th - I believe that we're going to go one day during the show - although I don't know if it'll be Friday or Sunday. I just bought that very color way of the very same yarn, I love it! 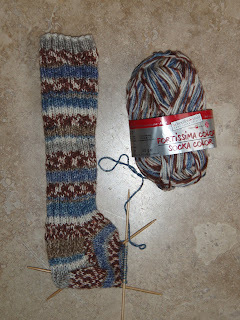 Your sock looks phenomenal--turning the heel always makes you feel so smart! Don't know why people make such a hallabaloo about turning the heels etc. You just learn it and that's it. Found you via A.D.D.- glad you kept the other foot. I've made about 10 pairs of socks and never really suffered SSS. I'm starting to wonder if it's an urban myth. I love the circular needle holder. One thing I found that works well for dpn's and notions are those cloth foldy jewelry holders. i found one at a mission store for $.99! i don't leave home without it. 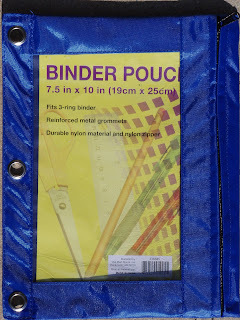 I don't know how much room you've got, but when you acquire too many needles for a box/pouch/binder, I would humbly suggest that you check out my solution. I don't know if I am supposed to shill my own blog here, but if you google Under Sask Skies you should find it. I think I posted it back in April or May.